rrIn the conclusion of a universe 10 years in the making, Avengers: Infinity War tells the story of Thanos, and his fight against the avengers in trying to get all the infinity stones, and stars Robert Downey Jr., Chris Hemsworth, Chris Evans, Chris Pratt, Josh Brolin, Elizabeth Olsen, Tom Holland, Scarlett Johansson, Pom Klementieff, Sebastian Stan, Zoe Saldana, Tom Hiddleston, Chadwick Boseman, Idris Elba, Paul Bettany, Mark Ruffalo, Anthony Mackie, Don Cheadle, and is directed by Anthony and Joe Russo. To begin, if you haven’t seen a majority of the previous Marvel films, you’re going to have no idea whats happening. Characters are tossed in randomly, and little development is given to anybody. I found myself questioning who a few people were, but before I could figure it out their scene was already over. But of course character development is not what we wanted in Infinity War, we wanted to see the Avengers fight the Villain that has been built up since Iron Man, and we definitely get that. At 2 hours and 40 minutes long—the longest Marvel movie yet—this movie takes you on a ride, with constant battle. The viewer is physically tired at the end of the movie along with our heroes. But possibly the best part of Infinity War is the villain himself. Thanos makes a great antagonist, with a goal, that while evil, is understandable. We get why he’s trying to get all the infinity stones. The best villains truly believe that what they are doing is the right thing to do. 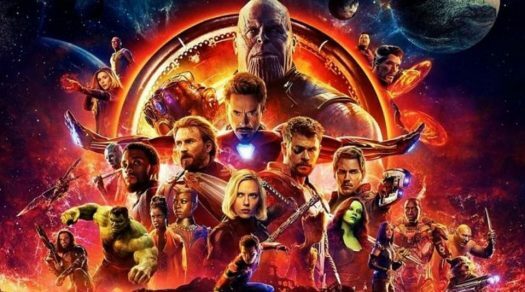 Avengers: Infinity War is the conclusion of a long list of movies, and will be enjoyed by any marvel fan.